Observation - Fowlsheugh Gull - UK and Ireland. 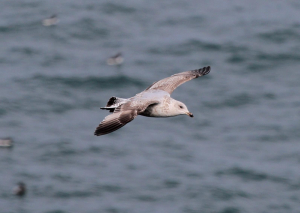 Description: Large juvenile Gull, Herring Gull size but with different markings,this Gull also has a light blue back? Large juvenile Gull, Herring Gull size but with different markings,this Gull also has a light blue back?